A process so simple, we could have tweeted it. It’s always a drawn out process. When you finally reach the point that you can’t wear your favorite pair of jeans anymore. Too many holes. The leg bottoms are all ripped up. Your girlfriend says they’re embarrassing. Or some online a-hole tells you you shouldn’t wear them anymore. It feels like the end of an era – these jeans have been with you on all of your best moments during their lifespan, since you wore them anytime you wanted to look good, which was every chance you got. If you’re like me, you throw them in the back of the closet to be used as painting pants so you can still slide into them on project days. It doesn’t have to be this way. You can make them wearable again – and if I dare – maybe make them better than they were originally. How? Simple. We’re going to dye them back to a rich dark blue. Now, this isn’t intended to cover up all of those beautiful whiskers, honeycombs, and stacks you’ve earned in your beautiful raw denim. Rather, this is for that pair of jeans that has faded from too many wearings and washings. For my first dye job, I chose a pair of Gap straight leg jeans that used to be a really dark blue. They’ve since faded to a royal blue with wallet and cell phone wear on the pockets. I like the way they fit all over, and they’re super comfortable. I wasn’t ready to ditch 'em quite yet. So I figured I’d double-down and see if I could breathe new life into them before sending them to project day purgatory. To my delight it worked. The dye process is incredibly simple, it barely needs a whole article. There are a few different ways you can do it, from using a washing machine, a bath tub, or a bucket, each having slightly different steps. I decided to go with the bucket method because I was scared of staining the tub or ruining someone else’s laundry in the communal washers in my apartment building. The dye I used is from the standard bearer of the industry, Rit. Available anywhere from grocery stores, pharmacies, or places like Target, Rit dyes come in lots of colors and are usually the only brand on the shelf. It comes in two forms, a powder and a liquid. I’ve used both, but for these jeans I used the liquid. Initially I dyed the jeans with a pack of the navy Rit powder dye, but this made them look more like colored denim than normal dark blue jeans. I went back and used black dye, and it gave me the exact look I was going for. I’d say you can skip the blue dye altogether. First, fill a bucket with the hottest water your faucet can muster. Pour half a bottle of black dye into the water and make sure it gets fully mixed in. Immerse your jeans in the bucket, and slowly stir until you’re satisfied that all of the material has been soaked thoroughly. Rit recommends half a bottle per one pound of fabric (about 3 yards) in 3 gallons of water. I like to use a scrap piece of wood to stir as to avoid touching the dye as much as possible. It won’t hurt you, and mostly comes off with soap, but it can leave remnants around your fingernails. Now, the jeans need to soak for an hour. The directions recommend constant agitation but I just stirred them every 10 minutes or so. The idea is that if it sits in one place for too long there may be spots that are darker than others. After your hour is up, dump the water down the drain and rinse the jeans with cold water until it mostly runs clear. Then, simply wash as normal in a washing machine. Anytime I wash jeans I like to pull them inside out to protect as much dye as possible. 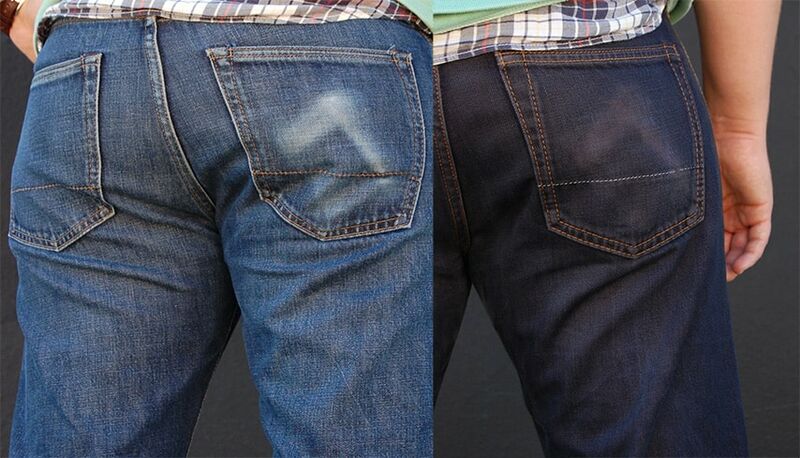 Let them air dry and blam-o, your favorite jeans should be wearable again. After you dump the water and rinse the jeans try to clean up the bath tub right away. The dye shouldn't stain if it doesn’t sit for too long on a surface. And to make sure your whites don’t come out gray on the next laundry day, it’s a good idea to run an empty cycle in the washing machine after your first rinse. I was so happy with how my jeans turned out, I decided to dye a favorite sweater of mine to a different color because it had some bleach spots. Originally a light tan, I dyed it to a dark wine color with great results. The concept is inspiring: Find a pair of light colored denim on sale for a too-good-to-be-true price? Dye ‘em dark. 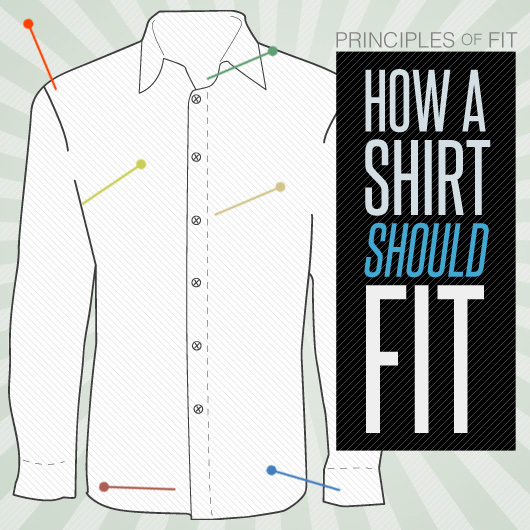 Have a faded old shirt that’s just too soft to pitch? See if dyeing it can breathe new life into it. If you try it, I’d love to see your pictures! Sounds like a good Sunday afternoon project! Great idea. You just saved me from spending a good $200 on a few more brand new Levi’s. This is absolutely brilliant! I didn’t have any trouble. I even tried rubbing my hand on them really hard afterward to see if anything came off and nothing did. It’d be smart to play it safe however. I think the final wash removes the excess. Have you washed the jeans a second time, with other clothes? Does the dye run any in subsequent washes? Hasn’t been a problem with ruining clothes, it does fade faster than the dye that the jeans come with. Still holding strong and better than try were. Rinsing thoroughly till the water runs clear and then washing separately in a washing machine with an old towel is the best way to ensure all excess dye is gone before wearing. Using our Dye Fixative immediately after dyeing also helps to reduce bleeding and keeps the new color longer. Every time I dye my faded black jeans using your instructions, the end result is ALWAYS the same. The jeans look exactly the same way they did when I started. Why? Hmm I’m not sure! Perhaps your jeans have some sort of coating on them that’s keeping them from taking in the dye? Thank you for that information Andrew! !, I’m about to dye my vintage denim jacket; all that was holding me back was devising a way to avoid blackening the stitch.. But if they used polyester (100%) in the late “70’s I’m so set tomorrow! How did the reverse side come out? I wondered recently whether something like this would work on jeans. Your results look fantastic! I actually did something similar with an old cotton jacket of mine that still fit great, but had a few orange stains that were never going to come out. I dyed it from a light green to a chocolate brown color and decided to also make it a waxed cotton jacket by applying some cans of Filson wax to the shell. It was time consuming, but the result was definitely cool. Thats awesome! Share some pics if you get a chance. Hey Andrew, here are two shots of the jacket. It’s been breaking in nicely and developing the type of great patina which you can only get from waxed cotton. I’m curious if the dye rubs off on your legs (or upholstery) when you wear them. Report back! Nope, didn’t have a problem with it. I think the rinse-to-clear and final wash helps with it, but probably best to play it safe anyway. AWWWWWWWESOME! On my to-do list for sure! Also, I’m wondering how the dye did’t adversely affect the color of the stitching! I was wondering that too! Not sure…maybe the stitching is coated with something, or the gold was too bright to dye. Rit dyes most materials but not 100% polyester. The stitching is usually made of polyester so it stays the original color while the rest of the material absorbs the dye. What about the paper patch (used to be leather) on the waist band of a pair of Levis that gives you the style number, size, has the Levi Strauss logo on it? does the dye change that? How is it that the stitches don’t change color? Keeping that contrast sets them off nicely. I heard somewhere that Rit only dyes cotton and natural fabrics. I’m assuming that the stitching is polyester or equivalent. Rit dyes most fabrics as well as things like wood, wicker, nylon, rope, etc. However, it doesn’t dye polyester so Sean is correct as to why the stitching stays the original color. One thing to keep in mind here is that you won’t get the same fading you get on normal denim, because you have now dyed the waft AND warp the same color, instead of one being indigo and the other being white. Also, if you happen to live by an art supply store (not a craft supply store like Michaels or Hobby Lobby), they should carry Jacquard dyes, which work incredibly well in comparison to Rit. This isn’t quite right. Indigo jeans fade to the centre colour of the warp, not the weft colour – check out the Naked and Famous Red Weft (fades to a blue with a red tone) versus their Red Core (fades to a bright red). These won’t fade because its an artificial, non-indigo dye. Now, if you wanted your jeans to fade again, you could buy indigo dye, and re-dye them indigo… but then they’d bleed everywhere like nobodies business. No, I’m afraid you’re the one who is not quite right. Yes, Rit is an artificial dye, but so is the dye used on most mass-market jeans like Levis, etc. Levi Strauss & Co. and its competitors haven’t used natural indigo dye in generations, they all use synthetic indigo, except for maybe a few premium, limited edition collections. And I know from experience that cotton clothes dyed with Rit dye do fade over time, and usually faster than the factory dye. Really cool idea. I have a pair of somewhat worn jeans that are the color of the undyed pair that I would prefer in the dyed color. Might just have to do this soon. Great article! I’m going to try this with a last ditch effort pair of jeans. Thanks Andrew! 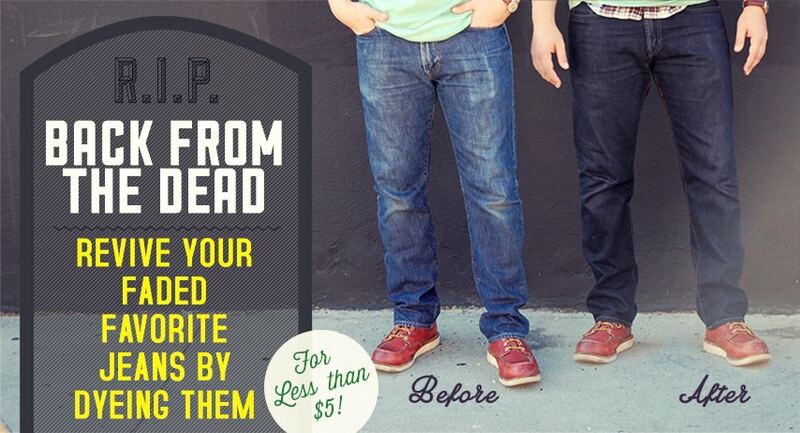 Good thing I just took all my old faded jeans to Goodwill last week… Oh well, I’ll keep it in mind for next time. How did the stitching come out unscathed? One would assume that the dye would stain the stitching around the pockets, seams, etc. I think it could. If you look at the photos you’ll see it didn’t completely cover up the phone and wallet wear, so it may not completely mask your unsightly fading. 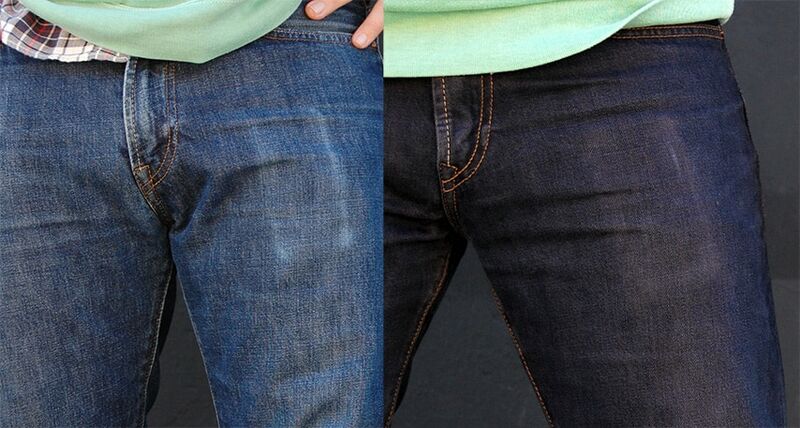 Yes, you can dye tan jeans too! We have a tan colored dye. I don’t think those are the same jeans. Looking at the stitching, there are some distinct differences between the two pairs. Most notably, the line of stitching going across the midline of the rear pocket is yellow in the lighter picture and white in the darker picture. Also, the two lines of stitching in the rear pocket seem to be farther part in the darker picture than the lighter picture. Finally, it seems that there is some wear to the stitching in the light pictures that has disappeared in the darker pictures. I agree…look at the stitching on the zipper specifically the bottom of the zipper…The diagonal stitches are facing the opposite direction…what’s up with that…. Agreed. Although I still think is possible why show two different pair? I noticed the stitching across the midline immediately. The dark jeans have a slimmer fit too, unless dye also fixes any stretching. Thanks for the comments. These pictured are two different pairs of the exact same jeans, bought on the exact same day. Their wear and fading were the same (as you can see on the pockets, etc), and so the before and after are 100% representative of the results. I only did one pair at a time because I was worried how they would turn out. Perhaps the most interesting thing is why there are these minute differences between the exact same model/style of jeans. In any case, sorry I didn’t make this clear in the piece, but I promise it worked as advertised. Would this method work on my Chucks? I have a pair of gray high tops that got splashed with bleach, so there are blotches of the off-white canvas all over the shoe. If I were to use a dark navy or black, would you think this would work? It might! Wouldn’t hurt to try. I’d be curious of the results if you do it. You can dye chucks but dyeing bleach stains is tricky as bleach damages the material’s fiber and the extent of the damage can inhibit the material from absorbing the dye. We have some tips on dyeing bleached items in our FAQs: https://www.ritstudio.com/faq/will-rit-dye-cover-bleach-spots/. I do this with black jeans, sweats and yoga pants periodically. Works great. It is clear that the pics are not of the same jeans. Just look at the stitching. It is clearly a different jean unless it is heavily photoshopped to look the way it looks. pretty Fake to me. When dying clothes, its a good idea to “set” the dye so its doesn’t run or wash out of your item. When you wash it for the first time, do it in the sink with some salt. The salt, for whatever reason, helps the fabric absorb the dye. You will notice that the water changes to the color of your dye…thats because you haven’t set the color yet. Let it soak for maybe 20 or 30 minutes, rinse with cold water and you should be good. I did this with a few white v-necks and the color held well for about two years. why black dye if your going for the dark blue ? The blue made it look like blue pants instead of dark denim. I must have not used enough dye. I feel like the jeans I dyed kinda look the same. Andrew, is it necessary to air dry them every time or is it possible to use the dryer after the first time they dry post – dying? I just tried it and will post pictures when they are dry. You run the risk of shrinking them more any time you use a dryer, since they’re cotton. I never dry any of my jeans. Here are the before and after pics. I used an old pair of Lee Premium Selects that I bought during my senior year of high school (2008). I’m really happy with the results. Worn areas dyed a bit lighter than less worn areas but not noticeably. I’m definitely going to do this again. Awesome! So glad it worked out for you. Thanks for sharing the photo, I love seeing them. This is actually pretty cool! What a coincidence as well because did you know that hotels and restaurants also dye their towels and other textiles to make it look new again? Basically, they’ve been using an industrial fabric dye for this, and the difference of this product compared to basic ones is that it can sanitize the fabric during the process. What is this process / technique called ? WOW! This worked well. I bought a pair of lightwash jeans off of eBay for less than half the price of new, and half a $5 bottle of RIT later they look amazing. Did the whole thing outside with a bucket, stick and hose, and then washed in my washing machine with an old towel. Will this work with Denim shoes? They feel the same as denim pants, look the same, and say that they are made from cotton. I would turn off the heat, I think. I have a pair of True brand jean they are blue with red and white sitching, well it still work or im out of luck??? Hi Andrew. Your article is inspiring to say the least. I just bought a pair of jeans on clearance. They look as though someone spattered the dark denim with bleach. I bought them for $8 and decided I would “fix” them later. They are a comfortable and a beautiful fit, so I figured, not much to lose, right? So I’m going to try this, only I’m afraid to use black. The jeans are a very dark denim with white “splatteries” all over them. They are super cute, but a little too loud for me. I will be trying this next week on my days off to see if I can get some softening color into those white places. I’ll send pics if it works. 🙂 Thanks again! Awesome!! Good luck, looking forward to hearing how it goes. I would REALLY APPRECIATE some advice on dying my jeans that have PARTIAL FACTORY FADING (as most designer jeans do these days it seems)!!!! I need to know how to darken JUST THE PARTS THAT WERE ORIGINALLY DARK, and NOT DYE the factory fading that is SUPPOSED TO BE THERE…down the center of the front of each thigh, and on the bumm. Put old towels down the legs to absorb any excess and use plastic bags to to keep the dye from going through to the back leg. Mix up just a little dye and rub it or spray it on the parts that need dying and let it soak in. It needs to be wet for at least an hour.